Ha Giang is one of the remote provinces in north of Vietnam. It is famous for the Dong Van Rock Plateau Global Geo-park. In the past, it’s not easy to come to visit Ha Giang because of complicated permit, it’s much easier now to get visiting permit but Ha Giang is still too far for tourist. Vietnam Motorbike Tour Expert designs this special Vietnam motorbike tour to Ha Giang to make Ha Giang – the most attractive destination in Vietnam closer to them. Within 5 days only, tourist can have full view of Ha Giang and other northern destinations of Vietnam and then take a night train back to Hanoi! 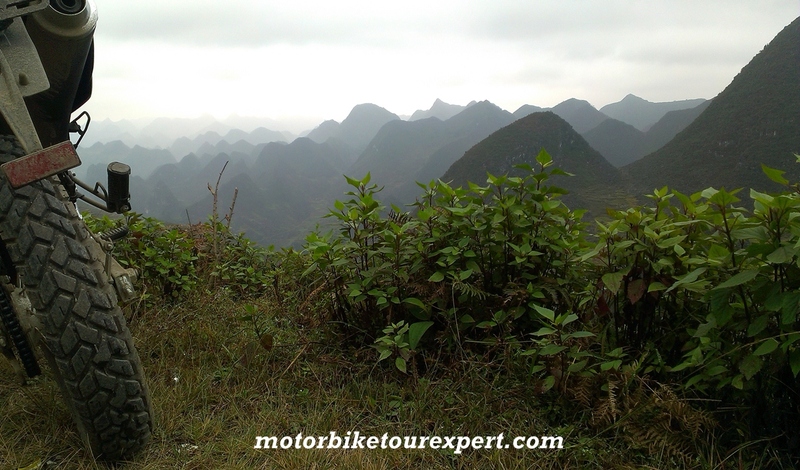 This is one of our best short motorbike tour to Ha Giang – northern Vietnam. 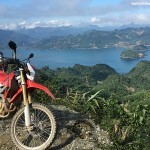 Day 1: Hanoi Motorbike Tour to Ba Be lake – 240 km. This Vietnam motorcycle tour to Ha Giang starts at around 8 AM from eastern suburbs of Hanoi. We try the best to avoid busy city road in the morning until Cho Chu town( in Thai Nguyen province) where we have lunch. After lunch, we surely have enjoyable motorbike ride to Ba Be lake because the roads have less traffic and offer you a lot of grand mountain view. At about 4 PM, we arrive Pac Ngoi – a beautiful village of Tay people which located peacefully at Ba Be lake’s side. Diner and stay with the Tay’s family. Overnight in Ba Be lake – home stay. Day 2: Babe lake – Bao Lac. – 120 km. After the early breakfast with the family, Take a short walk about 1km to the pier and then enjoy one and a half hour boat cruise around the largest natural lake in Vietnam – Ba Be. Lunch with the Tay family, In the after noon we will have off-road motorbike tour in Vietnam. We will ride the bikes through a small part of Ba Be National Park, many beautiful villages and some streams, the tour will give you a lot of challenge and amazing beauty of mountain area in northern Vietnam. Day 3: Motorbike Tour To The Dong Van Global Geo-park from Bao Lac. – 140 km. Today, we will have relaxing, easy and very enjoyable motorbike tour to Dong Van . Start the day at about 9 Am, ride slowly along the Gam river to enjoy the green mountains and mountains. We will be in Meo Vac for lunch. After lunch, it could be the best motorbike tour in Vietnam to ride cross Ma-Pi-Leng pass ( It’s one of the longest and most beautiful passes in North Vietnam. We can have hundreds of stops for picture of The Dong Van Rock Plateau Global Geo-park, and the local ethnic minorities. Day 4: Dong Van – Ha Giang. – 150 km. This motorbike tour to Ha Giang goes through the poorest part of Vietnam but the scenery is most imposing where you will be surprise to see many ethnic groups with their unique cultures and amazing mountain view of the Rock Plateau, the Vuong palace in Dong Van, The “Heaven Gate” in Quan Ba. 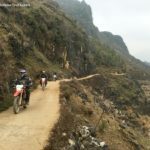 This motorbike ride to Ha Giang is surely one of the best Vietnam motorbike tours in the northern part with many interesting and amazing things in every meter of the road. Arrive Ha Giang in the late afternoon. Dinner and stay with the other Tay’s family. Day 5: Finish the Vietnam Motorbike Tour to Ha Giang in Lao Cai Train Station. – 180 km. After breakfast with family, we have smooth motorbike ride on road No 2 for a bout 40 km, and then we will take a turn to a small road to Pho Rang – the road is small and somewhere bumpy but scenery is completely different from what you saw in days before. The scenery is the wonderful mixture of green mountain, rice fields and graceful villages of the ethnic people. Lunch is in Pho Rang and after lunch we have easy Vietnam motorbike tour to Lao Cai on the winding road with the different view from what we’ve seen. Before getting into town center we will have short visit to China and Vietnam border, then motorcycle straight to the Lao Cai Railway Station and put all the bikes on the train. Finish the Vietnam motorbike tour to Ha Giang and take a night train back to Hanoi after dinner in Lao Cai.